…Ismoyo! 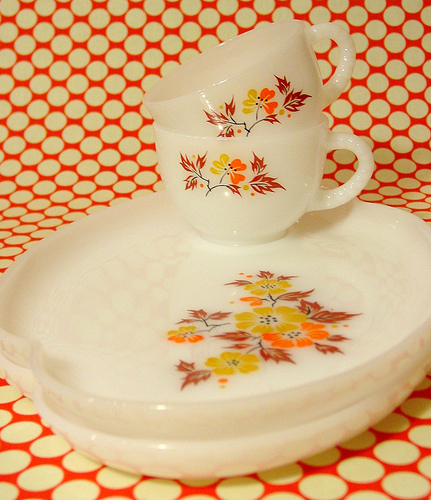 You’re the winner of the vintage milkglass plate and cup snack set giveaway from HappyDashery. Congratulations! Invite a friend over for some soup and a half a sandwich. Grilled cheese, I’m thinking. Enjoy it! And thank you very much to all who entered the contest. I know I had fun and I decided to do it more often, so check back here again for more fun vintage goodies. I’m all about sharing the vintage love (especially on superbowl sunday when there’s not much else going on for me, though I hear others might be enjoy some kind of football contest). This entry was posted on Sunday, February 3rd, 2008 at 3:13 pm	and is filed under HappyDashery, Vintage Goods. You can follow any responses to this entry through the RSS 2.0 feed. You can leave a response, or trackback from your own site. I feel so lucky! Thanks a bunch! They will be used and loved a whole lot. Still singing and dancing from joy!